You are here: Home / Our Animals / Chickens / 2 Ingredient All Natural Hand Wash For Chicken Mamas! Nobody likes having dirty, smelly hands after being in your chicken coop, which is why I developed a simple 2 ingredient hand wash that smells good and leaves you extra sparkly. Now this isn’t to say that chickens are dirty – they’re sweet, intelligent, lovable creatures. But I wouldn’t be a good expert if I didn’t advise you to wash your hands – and the hands of your little ones – after touching your hens. According to the Center for Disease Control, the best way to protect yourself after handling your chickens is to wash your hands with soap and water for 30 seconds, making sure to scrub your hands. Is it a cure-all? No, but it’s better than not doing it, and hand scrubbing is scientifically proven to reduce diseases. You can buy soap (like my calendula hand soap here) or make your own (goat milk soap is a wonderful thing). Either way, you’re being a responsible owner by keeping yourself healthy. 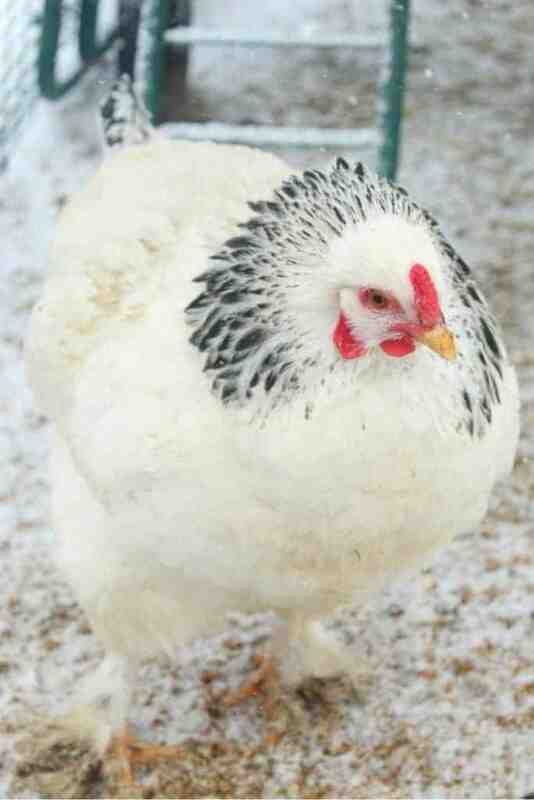 Bacteria can really become a problem when your hens have a high “bad bacteria” load in their guts. A simple way to counteract this is to give them probiotics. The idea is the probiotics help good bacteria proliferate, which crowds out the “bad bacteria” such as salmonella, campylobacter, and E. coli. Giving your hens apple cider vinegar and fermented feed is a step in the right direction. After using soap and water, you can follow up with a second wash that includes aloe and essential oils. Two of my favorite oils for this recipe are Young Living’s Thieves essential oil blend and Animal Scents Infect Away. I only use a few drops and the bottles last quite a while. You can use any essential oil brand you like, just be sure the company is reputable and the oils are 100% pure. Really do your homework, because the oils you see at big stores say they’re 100% pure on the box, but there’s no guarantee the oils in there are properly distilled or even the oils they claim on the label. 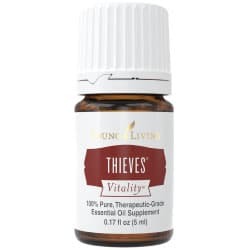 I like using Young Living’s Thieves oil blend, which includes Clove, Lemon, Cinnamon, Eucalyptus Radiata, and Rosemary essential oils. If you’re wondering about the name, it’s inspired by a story originating in the Middle Ages. According to legend, thieves would use a combination that included of fresh spices, and the essential oils would keep them healthy as they pilfered the possessions of people who had died from the Black Plague. The story goes that because of the combination, they didn’t get sick from the Yersinia pestis bacteria said to cause the disease that killed nearly 50% of Europe in the 1300s. The other oil I like to use, Infect Away, is formulated specifically for animals (although it’s also great or people) and comes pre-diluted with a carrier oil. You’ll also need aloe gel which will help soften and keep your skin healthy. To 6 ounces of aloe gel, you can add 30 drops of your oil of choice. I like using Thieves so I use 30 drops of Thieves oil. Shake to combine, and leave on your shelf to use after you wash your hands. 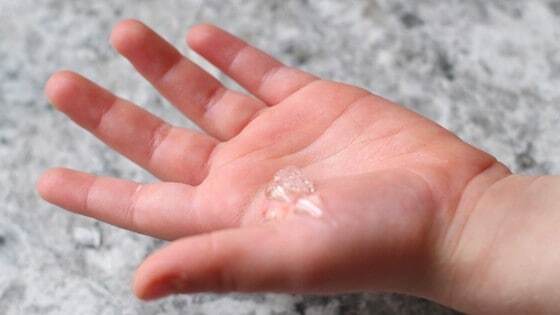 You don’t need to wash your hands after putting the aloe gel mixture on; doing so would reduce the effect of the gel. If I’m in a rush, I’ll just use the 2 ingredient hand wash.
My favorite 2 ingredient hand wash is also great after you come in from gardening or playing with other pets! I hope you enjoy making it!